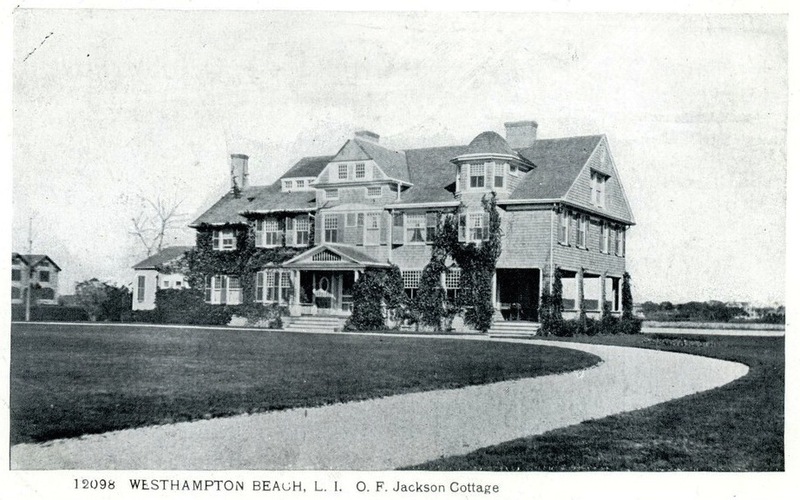 'Fairlawn', the Theodore Frelinghuysen Jackson residence built c. 1902 in Westhampton Beach. Jackson, an attorney, studied law in Manhasset under Judge Horatio Onderdonk. He was president of the Union Ferry Co. of Brooklyn and the New York and East River Ferry Co. Jackson was also Brooklyn City Comptroller from 1889-1891. He died in 1913 at the age of 83. 'Fairlawn' was demolished in a controlled fire set by the Westhampton Fire Department on behalf of the home's final owner, Henry L. O'Brien (thanks to Anne Surchin, co-author of Houses of the Hamptons, for that last bit of info). My observations: a well done shingle style house that wisely followed Ancient’s admonishment to “stain, don’t paint” although I’m sure that ivy played hell with the shingle exterior. I really like those two horizontal windows in the center projection in the roof, giving the illusion there was one more story to this house than there actually was. I’m a little surprised not to see any balcony or sleeping porch on the second or third floors (at least from this angle). & yet Mr. O'Brien asked the Westhampton Fire Department, "Would you please burn down my house?" & of course they did ... sigh.